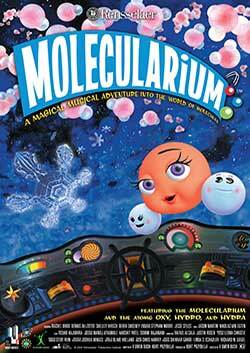 "Molecularium": the award-winning digital dome experience, is a science lesson, a thrill-ride, and a magical musical adventure in a world of atoms and molecules. Aboard the Molecularium, audiences join a cast of atomic characters on an immersive and unforgettable adventure into the nanoscale universe. Explore billions and trillions of atoms and molecules with Oxy, a precocious oxygen atom, and Hydro and Hydra, her wacky hydrogen pals. Ride from the atomic structure of a snowflake to the far reaches of space aboard the Molecularium, the most fantastic ship in the Universe.